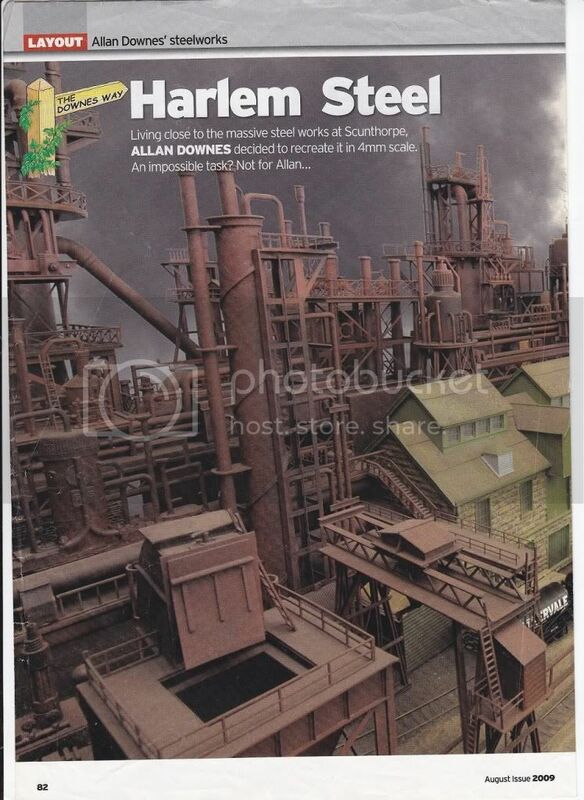 Allan has advise me that he has permission from Model Rail to post his photos/scans of his articles from Model Rail. 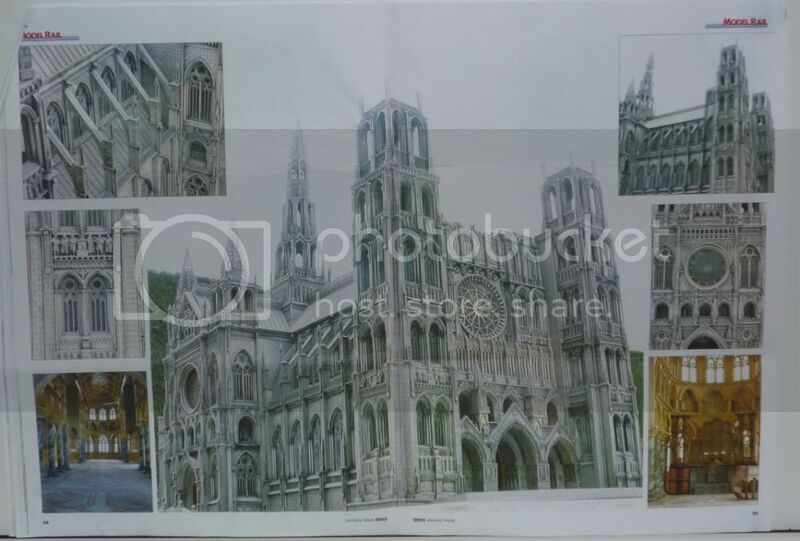 allan downes wrote:Standing 4ft long by 14 inches wide and 4ft high, weighing a ton and built in six months at a cost of 25 grand back in the 70s a scandalous mix of RIEMS front, NOTRE DAME rear, and anything I could think of in between!! A friend of mine built a model of Jervaulx Abbey from Linka mouldings several years ago. Now, I just have to ask, are you by any chance THE Allan Downes ? 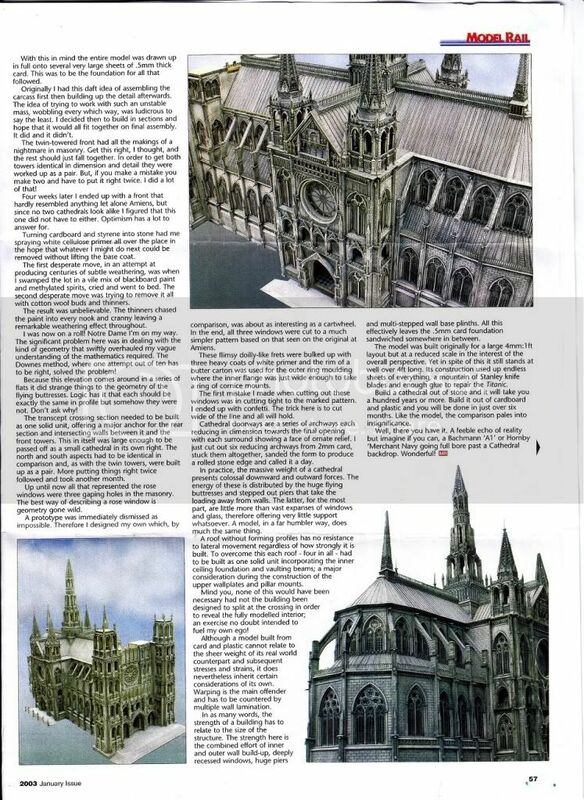 I know a bloke who made a model of his local Abbey - the Abbey National! That Abbey - absolutely bloody marvellous!!!! !beats the hell out of mine!! - any idea how long it took to build? If you're refering to THE Allan Downes that's been filling all the railway magazines with incomprehensible drivel for the last 40 years then yes, it's me!! Just loved the laughing dog! 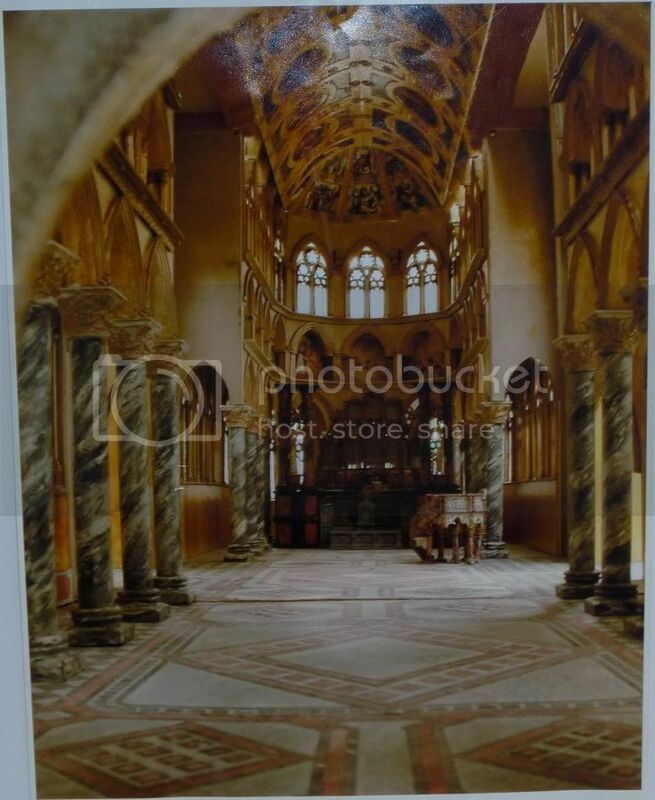 Thanks for the compliment re the cathedral, it now lives in an Italian millionaire's villa on the Isle Of Ischia, Bay Of Naples - wherever that is. allan downes wrote: Hi Peter. Including the initial research, Derek spent 5 years doing Jervaulx Allan. The amazing thing is, he only had 1 single set of the Linka moulds (which now reside with me ) so it took him an age to do all the casting. Whilst it's certainly good, I'm not sure I'd go as far as saying it beats the hell out of yours !! There's very little in the way of model buildings that could ever do that. Your "incomprehensible drivel" has been gazed on with awe for many years Allan and I feel somewhat humbled to be writing to someone I've always held in such high esteem. This site has suddenly taken on a halo !!!! Hey Peter, I think your'e over doing it with all the praise...er, I didn't quite catch it all the first time, could you repeat it in upper case!!!!! Seriously though, the only reason that I became well known was because I couldn't even cut a piece of cardboard in half without telling the whole World about it! Halo you said, Hmmm, interesting, interesting.... now THAT'S more like me! Best regards Pete while it's still in place! Thanks for sharing that, Allan. I hope we're going to see lots of your buildings Allan - old and new. With yourself, Dooferdog and Perry as members, we don't need to go anywhere else to see master builders at work. A standard few of us can ever hope to match. Allan - welcome to the forum from me !! I have to say your 7mm model of 'Polperro' was largely instrumental in my getting into building model buildings - I searched high & low for copies of the article, then chanced upon your images of the models for sale. Whilst I have a long, long, way to go to reach your standards, at least I know in which direction I need to be going ! All photos I post are ©Stu Hilton, but are free for use by anyone. If I ever took on anything that big my layout would never get finished! Was it a commission Alan, if you don't mind me asking? To me, to fit it into a layout, the rest of the townscape around it would also have to be built to do it any justice... And THAT would definitely take up more time than my layout could survive. Oh... And welcome aboard. Enjoy the ride. I've just re-read the article above Allan and, like all "master modellers", you make it sound so simple. 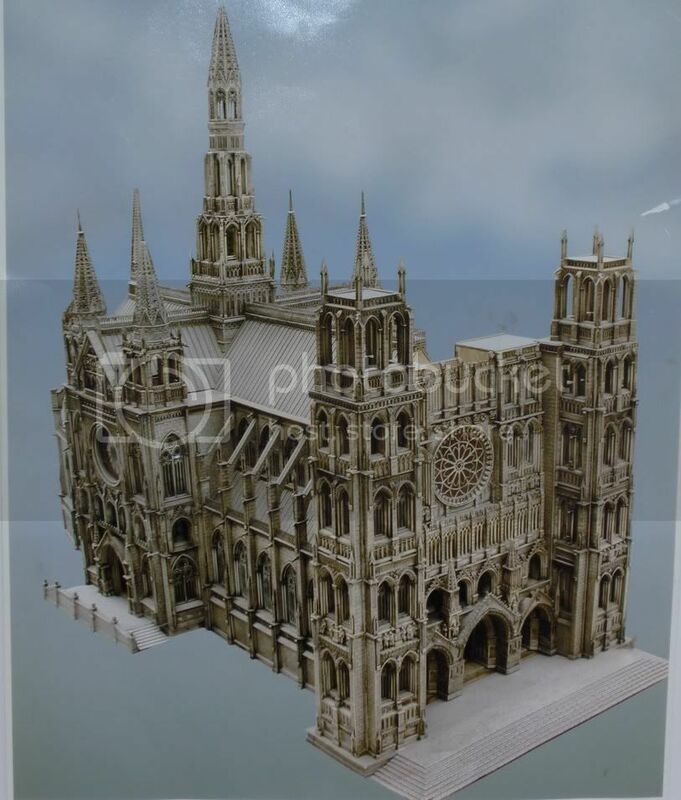 From playing with Scalescenes kits, I'm well aware of just how strong a laminated card model can be (and presumably, the same goes for plasticard) but how did you manage all the "rolled" details - the window mullions and surface details of the flying buttresses ? 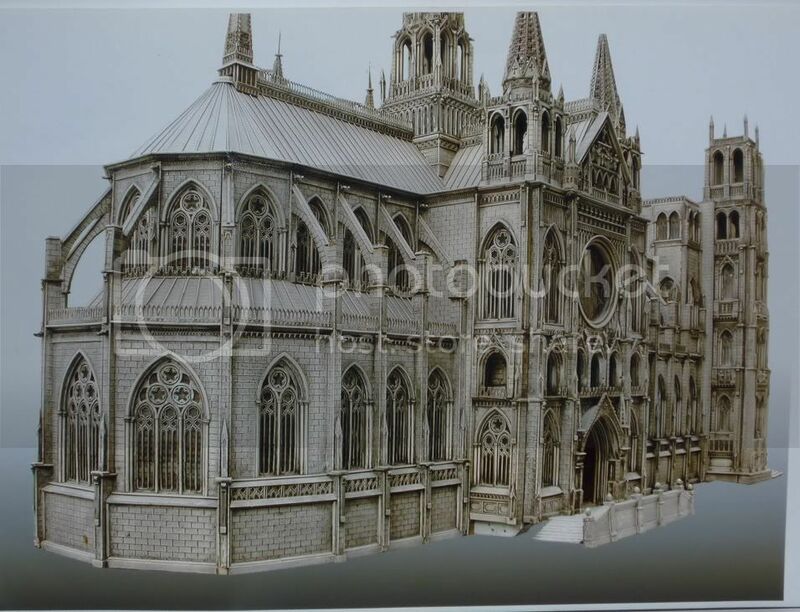 Also, a little about how you did the intricate details on the spires would be fascinating. Whilst the overall impression of the building is stunning, once you start to look carefully at the details, one wonders how in heavens name you actually did it. Well that worked - but I bet this one won't!! Now there's no stopping me!! 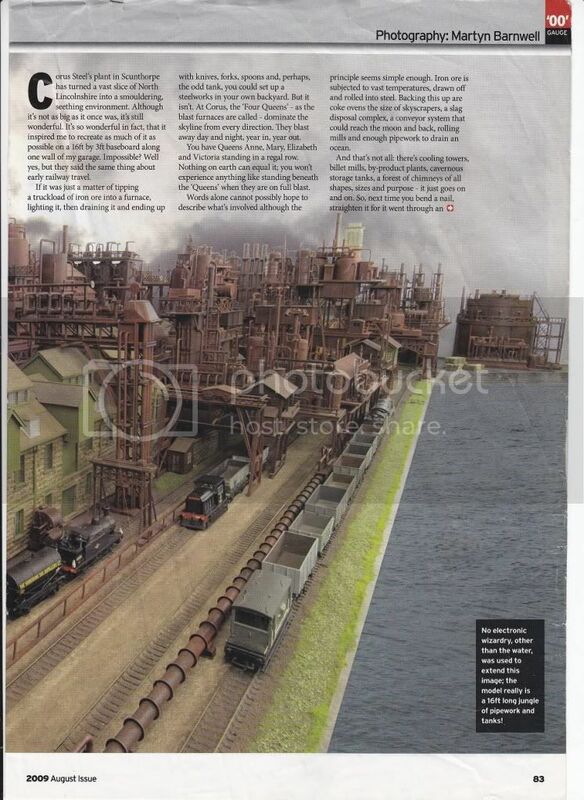 HARLEM STEEL as it appeared in MODEL RAIL MAGAZINE. You are here: Your Model Railway Club > More Practical Help > Scratchbuilding. > Larger than life buildings!